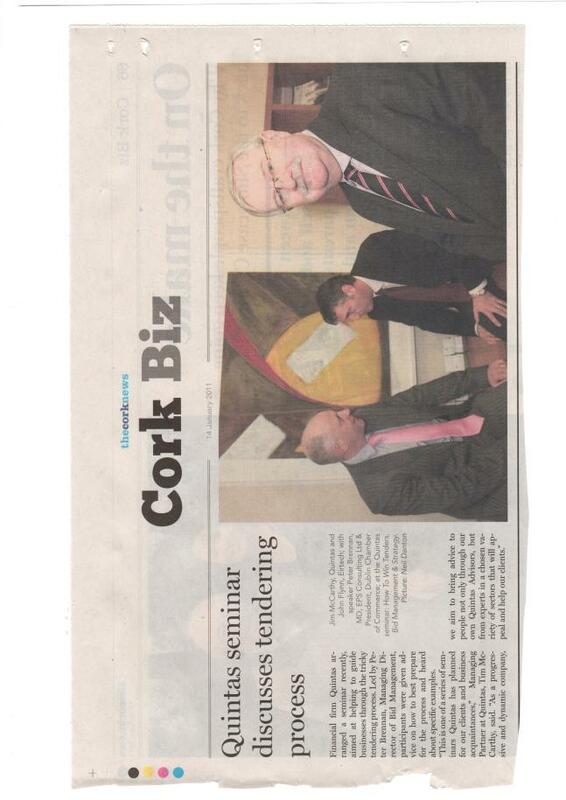 Quintas sponsored Cork Chamber Christmas Lunch 2010. Quintas were delighted to sponsor the Cork Chamber Christmas Lunch for the second year in a row which took place on Thursday the 9th December in the Maryborough House Hotel. 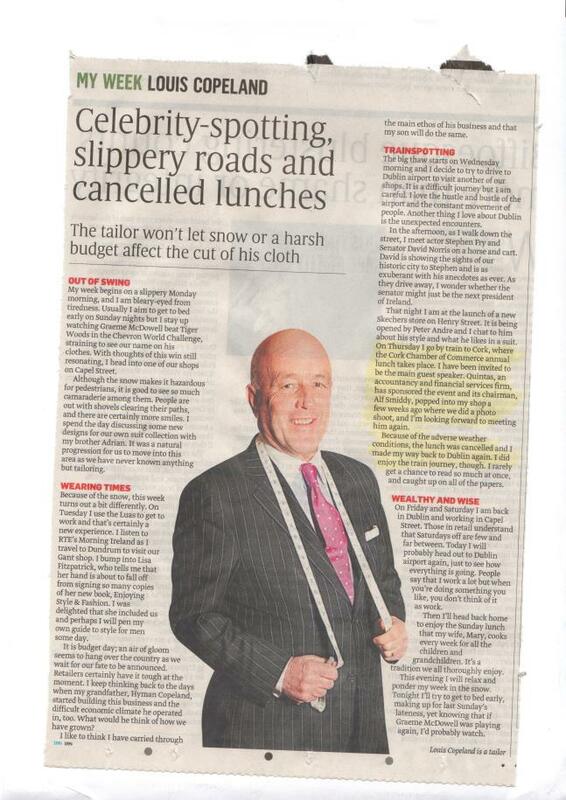 Louis Copeland, a man renowned as much for his business savvy as his style, was the Guest Speaker at the lunch. A Quintas Quiz took place during the lunch with all the prizes having been donated by Quintas clients namely, Heritage Hampers - Carrigaline, Ballycotton Seafood - English Market & Midleton, Posh Nosh - Rathcormac, Crustys Bakery - Douglas Court and Blackpool Shopping Centres, Hennessy Hair and Beauty - Wilton and Pembroke St, Irwins Pharmacy - Mayfield, Togher and Shandon St, Classic Drinks - Little Island, The Brook Inn - Glanmire, Falveys Pharmacy - Douglas, Egans Opticians - Lavitts Quay, Corporate Travel Management - Little Island. We would like to take this opportunity to once again thank all these clients for contributing to the Quintas Quiz prizes. 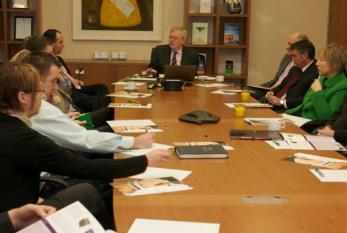 Quintas host a seminar on 'How to Win Tenders, Bid Management and Strategy'. Quintas hosted a seminar on on the 19th November on 'How to Win Tenders, Bid Management and Strategy' which was given by Peter Breenan, President of the Dublin Chamber of Commerce and Finance Director of Bid and Tender Management Services. Quintas sponsors the CPA Capital Games Conference. Quintas were the main sponsors of the CPA Capital Games Conference which was held in the Radisson Blu (SAS) Hotel and Spa, Little Island, Cork on 25th November. Main speakers at the event were Bobby Kerr (Entrepreneur, Dragon & Chairman of Insomnia), Kenny Kane (Director, Quintas) and Ciaran Desmond (Managing Partner, McGuire Desmond Solicitors). Nick Charalambous has been appointed as Director of Sales and Distribution. Of Cypriot background and raised and educated in London, Nick is a graduate from the London School of Economics with a degree in Economics (BSc). Nick has worked in Financial Services in Ireland for the last twelve years having had private client roles in Ulster Bank and ACCBank. He joined Quintas Wealth Management two years ago to head up their Sales and Distribution function. Nick will be responsible for managing the distribution of all Life/Pension and Investment products for Quintas and will be ultimately responsible for the Sales and Distribution team. 'How Budget 2011 has impacted on your pocket'. Quintas recently issued a flyer to all its clients and business contacts on 'How Budget 2011 has impacted on your pocket'. This flyer gave a summary of the key changes for employers & employees due to Budget 2011. If you would like to view this flyer please click here. Quintas launched The Horizon BES Fund in November. Galway Independent - 3rd November 2010. Irish Examiner - 29th October 2010. Quintas have completed the run of articles in Thursdays edition of the Cork Independent which appeared in the Business & Training section of the publication. To view the articles which have appeared in the publication please visit our website www.quintas.ie and go to latest news items under Quintas Registered Auditors.